"He's not ready to give up so neither am I. I will do what I can to help him." The odds against a cat being reunited with his family after a ten-year separation must be at least a million to one. For one to have survived being severely burned in a deadly wildfire surely must be equally daunting. As incredible as it may sound, a long-suffering and determined thirteen-year-old brown tom named Pilot from Santa Rosa has succeeded in pulling off both of those utterly amazing feats. Since he, regrettably, does not speak any language that humans are capable of comprehending, the best that can be done is to take the elliptical accounts and recollections of those who have known him, conduct an analysis of the circumstances, and then to sprinkle in liberal amounts of both logic and supposition in order to piece together the tapestry of his incredible story of survival and triumph over simply outrageous misfortune. Like so many cats, Pilot was abandoned as a kitten. He most likely was either dumped at a shelter by his utterly worthless owner or arrested by Animal Control officers and then subsequently incarcerated. In 2004, he got a tremendous break when he was adopted, presumably from a shelter, by Jennifer Leigh Thompson. Over the course of the following three years he, from all accounts, enjoyed a happy and contented life with her, her husband, and children. 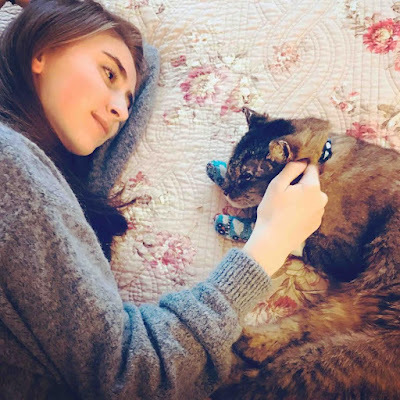 "He was an indoor-outdoor cat that always came home every evening like clockwork," she wrote November 2nd on Go Fund Me. 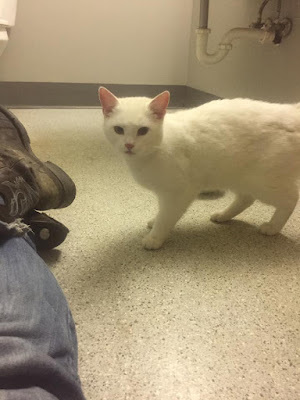 (See "Help with Pilot's Veterinary Care.") "He is a very special cat who loved my kids, loved to play in water, and followed us around like a dog." One day in 2007, however, he failed to come home. "We were devastated," Thompson continued. "His disappearance was extremely traumatizing to us." Although it has not been disclosed what other efforts she undertook in order to locate Pilot, shelters were, quite obviously, the wrong places for her to have been looking for him. Also since she was then working in the veterinary field, touching bases with local practitioners would have been the second most logical place for her to have looked but that, too, would have been another cul-de-sac. Since only shelters and veterinary offices possess the scanners that are required in order to decipher them, microchips are totally worthless unless lost cats are, one way or another, brought into one of those facilities. 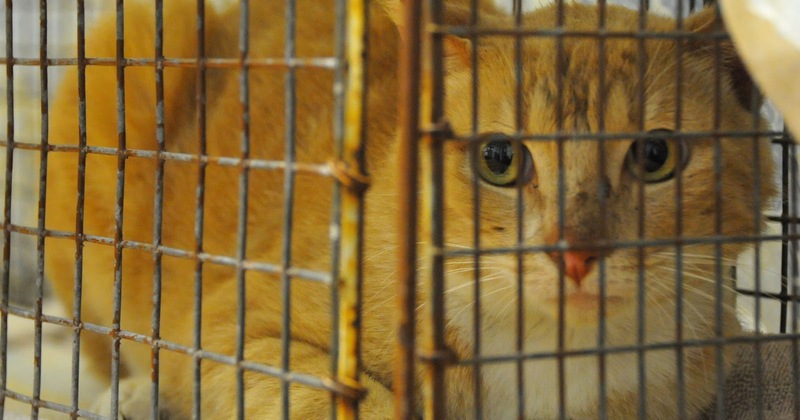 Almost as disturbing, it is far from clear if veterinarians and shelters are under any legal obligation to notify former owners whenever their long-lost cats turn up at their surgeries and houses of detention. The most logical explanation in Pilot's case is that he was stolen by an individual who afterwards kept him confined indoors; otherwise, he surely would have returned home. That individual likewise was astute enough to have removed and gotten rid of his collar and tag. The only other explanation that readily comes to mind is that Pilot voluntarily left home due to a conflict with another cat or a dog. That is an expedient that some cats have been known to adopt, especially if they have been subjected to repeated bullying. Only Thompson knows if that were indeed the case but she has not publicly speculated one way or the other on what caused him to leave home. Meanwhile at the Thompson household, new cats and dogs came and went and she and her family soon forgot all about Pilot. In 2007, they pulled up stakes and relocated to Longmont, fifty-three kilometers north of Denver, where she settled into the avocation as a pet sitter and dog walker. A decade later and halfway across the country, the infamous Tubbs Fire broke out in Sonoma and surrounding counties in early October and in its wake it burned more than thirty-six-thousand acres of land, killed twenty-two individuals, and destroyed more than five-thousand buildings. In Santa Rosa alone, the fire inflicted an estimated US$1.2 billion in damage and that included the burning down of more than twenty-eight-hundred buildings. All totaled, a full five per cent of the city's housing stock went up in smoke. 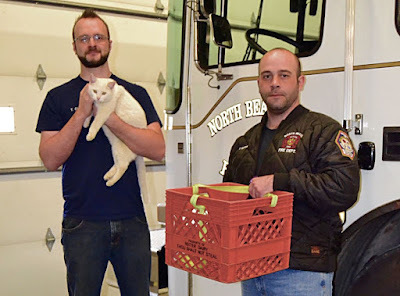 On All Hallows Eve, a miracle almost too incredible to believe occurred when an unidentified Good Samaritan came upon a famished and dehydrated cat that was stumbling along on four badly burned paws. His whiskers were gone and his ears had been burned to a crisp. Although the poor cat looked to be more dead than alive, this truly wonderful and compassionate individual did not hesitate to transport him to the PetCare Veterinary Hospital at 2425 Mendocino Avenue where the staff consented to attempt to save his life. 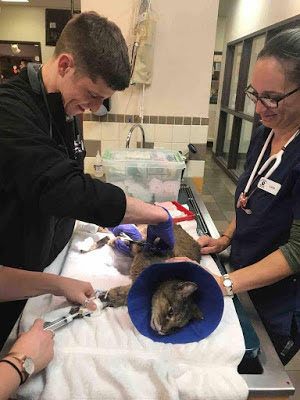 Press reports have not specified if the surgery voluntarily chose that course of action or if the Good Samaritan was required to pay up front for the cat's emergency care. Be that as it may, the cat's paws were burned to the bone and that necessitated that the veterinarians had to sedate him in order to clean, medicate, and bandage them. Antibiotics, analgesics, an Elizabethan collar and, in all likelihood, intravenous fluids were administered to him. While they were at it, they routinely scanned him for an implanted microchip and that is how that they belatedly learned that he at one time had been owned by Thompson. Inexcusably, she had not paid the administrator of the chip's database to maintain her current contract information on file and that in turn necessitated that the staff at Petcare had to track her down by telephone. To say that the telephone call that Thompson received from PetCare came as shock would be a gross understatement. "I never in a million years imagined that we'd ever see him again," she swore to The Mercury News of San Jose on November 3rd. 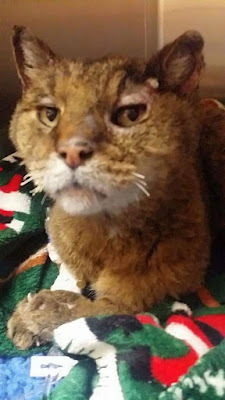 (See "Cat Missing Ten Years Is Found Burned but Alive in Wine Country Fires.") "It's amazing he survived all of that." In particular, it is estimated that Pilot had been hobbling along on his own for at least two weeks after the fire. Not only was he in excruciating pain but he had almost nothing to either eat or drink during that period. Nevertheless, he was able to somehow and some way persevere for just long enough until the Good Samaritan entered and saved his life. After Thompson had gotten over the initial shock that Pilot was indeed still alive, she was confronted with a litany of sobering and daunting dilemmas. Most importantly of all, did she want him back? Secondly, how badly did she want him back? Specifically, was she willing to invest the enormous amounts of money, time, and care that were going to be required in order to make him well again? Finally, even if she were willing to do all of that, how on earth was she going to be able to pull it off? After all, veterinary care is outrageously expensive and Longmont is twelve-hundred-thirty-eight kilometers east of Santa Rosa. As far as it is known, Thompson never hesitated and instead listened only to the calling of her heart. "He's not ready to give up so neither am I. I will do what I can to help him," she promised November 2nd on Go Fund Me. "He's in really good spirits and gets excited and wants to be petted and loved the moment someone opens his cage door at the veterinary hospital." In furtherance of that noble objective, she established the Go Fund Me page referred to supra which as of November 19th had raised US$4,288 from one-hundred-twenty-seven donors. That is a good start but it is hardly going to even begin to cover the cost of Pilot's long, tedious, and difficult recuperation. For instance, he is going to require daily visits to a veterinarian for at least two months. During such visits he is going to have to be sedated so that his bandages can be changed and his paws medicated. No figures have been floated, but each of those visits is surely going to cost Thompson hundreds of dollars. "It's been very difficult not being able to see him right away but the staff at PetCare has been amazing with keeping me updated and sending me photos," she informed The Sacramento Bee on November 3rd. "I can't wait to see him. I'm excited and my kids are excited!" While she was finalizing plans to wing it to Santa Rosa so as to collect Pilot she received some encouraging news that made the agony of waiting a little bit easier to bear. "Pilot is really doing well!" she exclaimed November 4th on Go Fund Me. "He's getting transitioned onto oral medication now (from, presumably, being fed intravenously) which is a very positive thing. And he's gaining weight!" The long awaited and much anticipated reunion with her long-lost cat finally came about on the evening of November 8th and nobody either inside or outside of Hollywood could have scripted the dénouement any better. "He was asleep when I walked into the hospital ward at PetCare and immediately raised his head and turned around when he heard my voice," Thompson disclosed November 9th on Go Fund Me. "I am overjoyed and the tears were flowing! I have no doubt that he remembers me." Not a great deal is known about the recall capabilities of cats. They do, however, most definitely remember familiar smells and voices. On the other hand, their personalities and behavioral characteristics seldom change over time regardless of how much adversity should befall them. Consequently, just because a long-lost cat still behaves as before does not necessarily prove that it still recognizes its former owner. A day earlier Pilot had undergone surgery in order to have an unspecified number of his claws removed because they were said to have been interfering with the healing of his paws. Nevertheless, he was still well enough to have spent the following night with Thompson at her sister's house. "Pilot slept in my bed with me last night. I finally felt some peace with this sweet boy next to me," she continued November 9th on Go Fund Me. "He is still such a snuggle bug. Ten years have not changed a thing." The same thing could be said about Pilot's interim guardian, but doing so would not cast that individual in a positive light. First of all, it is difficult to comprehend how that anyone could be so callous as to run out on a cat that either he or she had sheltered and fed for, presumably, a decade. Secondly, that individual did not even have enough concern to come forward and attempt to reclaim him even after his story and photograph had been splashed all over both mainstream and social media. Of course, it is remotely possible that the individual in question perished in the inferno but even that would not excuse family members from coming forward and doing the right thing. Since it has not been disclosed either where Pilot was found or where Thompson previously resided in Santa Rosa, it is difficult to draw any conclusions. Nevertheless, it is entirely possible that it was precisely one of her neighbors who had stolen him and that he consequently had been living for the past decade only a few doors down the street from her old abode. If the assumption that Pilot was stolen is correct, it is highly unlikely that his interim guardian ever will attempt to reclaim him. That would appear au premier coup d'oeil to foreclose the possibility that Thompson and her family will be forced to go through a grueling and heart-wrenching custody battle. Pilot flew home to Longmont with Thompson sometime last week. Although their itinerary has not been publicly divulged, their trip most likely originated with an automobile ride to the Charles M. Schulz Sonoma County Airport, eleven kilometers northwest of Santa Rosa. From there, they took an approximately one-hour flight to San Francisco. Following a ninety-minute layover they then took a two and one-half-hour flight to Denver. Upon arrival, they were forced into taking another trip by car to Longmont. Even under normal circumstances such a journey would have been quite an ordeal but having a sick cat along must have made for quite a trying experience for Thompson. They did luck out on the last leg of their journey in that the plane was not crowded. In fact, they had an entire row of seats to themselves and the stewardess graciously consented to allow Pilot to occupy one of the empty seats alongside Thompson as opposed to flying on the floor. She thus was able to communicate with him and to monitor his condition en route. Given that he must be sedated on a daily basis in order to have his bandages changed, hopefully he was able to have made the trip without having any additional potentially harmful narcotics pumped into his system. As far as it is known, they did not have to contend with any soaks or other miscreants during their trip. Overall, he "traveled pretty well for the most part," Thompson wrote November 16th on Go Fund Me. Once they finally arrived home, Pilot was reunited with Thompson's now eighteen-year-old daughter who had loved him so much that she had experienced nightmares when he disappeared all those years ago. Not surprisingly, their meeting proved to be every bit as emotional as had been Thompson's with him a few days earlier. "She came in the room and he started chirping away (he has this little chirp that he does) when he saw her and she started talking," Thompson disclosed on Go Fund Me. "It was pretty amazing. They've been hanging out now as much as possible." Pilot's amazing odyssey that has taken him from being missing and presumed dead all the way back to the present and the world of the living also has made it possible for the fissures in the heart of Thompson's daughter to finally heal. "This is what means the most to me. Our cat is here," Thompson continued on Go Fund Me. "He is healing. We are doing whatever we can to help him heal. And he and my daughter are happy." Now that he has left Santa Rosa, Pilot's continued care has been handed off to James K. Skelly of the Foxtail Pines Veterinary Hospital in Erie, seventeen kilometers south of Longmont. While there is not any reason to question his competency, he nonetheless is a graduate of PennVet in Philadelphia and his father even worked at the surgery. The problem with PennVet and by extension its parent, the University of Pennsylvania, is that the both of them are staffed almost exclusively with bloodsucking capitalists who do not possess so much as a scintilla of respect for the sanctity of animal life. For example around Christmastime in 2013, staffers at the Matthew J. Ryan Veterinary Hospital steadfastly refused to treat a cat that accidentally had swallowed a piece of ribbon because its owner was unable to come up with the thousands of dollars that they had demanded in advance. They instead elected to kill it on the spot. That was in spite of the fact that the University of Pennsylvania boasts an endowment in the billions. Furthermore, the practitioners at Ryan experiment on and torture to death countless cats, dogs, and other small animals each year during the course of their utterly worthless experiments. The same sort of atrocities are carried out at PennVet's satellite campus, the New Bolton Center in Kennett Square, where its veterinarians line their pockets by pimping and whoring for meat, egg, and milk producers, the horse racing industry, and other serial abusers and killers of large animals. It accordingly would be extremely unwise for Thompson to count on Skelly to either extend her any credit or to give her any discounts. Much more to the point, anyone even remotely affiliated with either PennVet or the University of Pennsylvania should be avoided like the plague, let alone subsidized in the commission of their wholesale crimes against cats and other animals. Looking ahead, the burns to Pilot's paws and ears should heal in time although he may require skin grafts in order to complete those processes. The real menace to his health are the drugs that he is being given in order to sedate him and that is a major problem considering his advanced years. In particular, sedatives can cause renal and hepatic failure as well as Hypertrophic Cardiomyopathy (HCM), the latter of which does not always show up on blood tests. Some people claim to have had a measure of success using such natural sedatives as Feliway® and Rescue Remedy® but it is doubtful that either of them would be potent enough in Pilot's case. 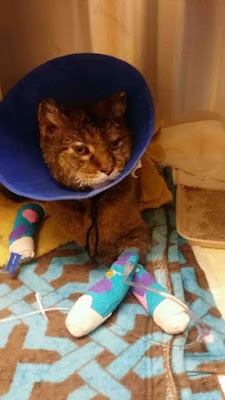 At the very least, only the tiniest doses of tranquilizers should be used, his heart rate continuously monitored, and oxygen provided if needed whenever his bandages are changed. It might even be possible to combine smaller doses with some sort of physical restraints. After all, a screaming, scratching, and biting cat is far preferable to a dead one. It thus would appear that the best that can be hoped for is that his paws will soon heal to the point that his bandages can be changed less frequently. 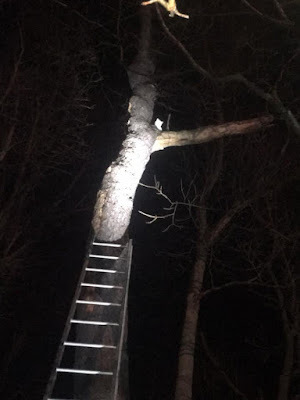 Until that day arrives, Skelly and Thompson are going to be walking a tightrope, hoping against hope that his paws heal before the tranquilizers kill him. The roll call of honor in making Pilot's deliverance a reality includes first and foremost the Good Samaritan who, true to the fraternity, has refused both all acknowledgement and thanks. The dedicated staffers at PetCare likewise are to be commended for their steadfastness and veterinary skill. Last but certainly not least, it is the lovers of the species who have so generously opened up both their hearts and wallets that are making Pilot's recovery a reality. "I want to say thank you to every single person who has donated to us," Thompson wrote November 4th on Go Fund Me. "My family is beyond grateful and I am truly humbled by the outpouring of love and generosity." They certainly have their share of detractors, but there are not any people quite like cat lovers. "When a man loves cats, I am his friend and comrade, without further introduction," Mark Twain once observed and the outpouring of support that Pilot has received proves beyond the shadow of a doubt that many individuals still feel that same way today. 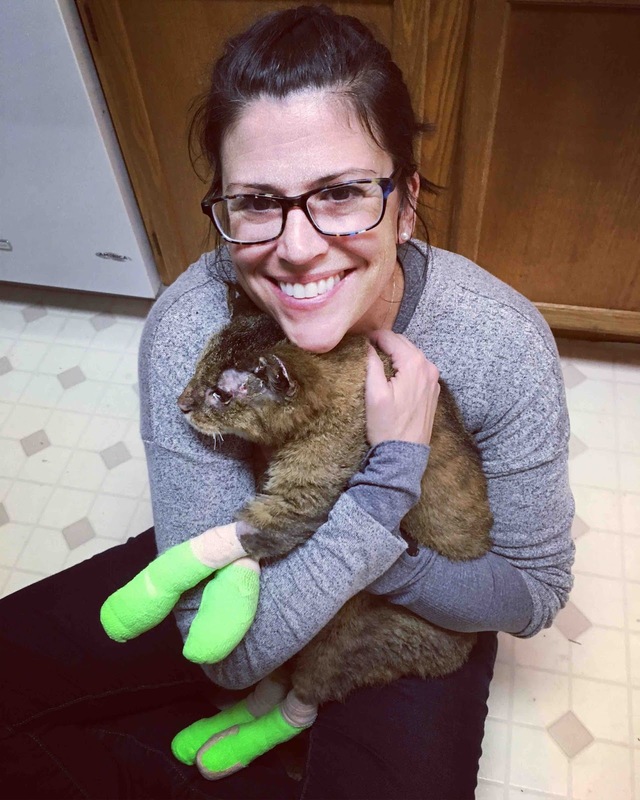 The final chapter is yet to be written, but to have lived an altogether different existence for a decade, to have survived the Tubbs Fire, and now to have been reunited with Thompson and her family is quite an accomplishment for any cat. Without the implanted microchip, however, PetCare would not have treated him unless someone else had agreed to pick up his veterinary tab, Thompson and her family would have remained forever in the dark as to what had become of him, and his incredible story of courage and survival never would have come to light. Although microchips are totally worthless when it comes to protecting cats from humans and animals that are intent upon doing them harm, they nonetheless, like DNA analysis, are rewriting history. It therefore is precisely because they have so revolutionized the almost hopeless task of finding long-lost cats that aggrieved owners never should give up hope. As Pilot and thousands of other cats already have proven, many cats that have been presumed long dead have instead gone on to live other, often lengthy, lives. For Thompson, being reunited with Pilot has been somewhat bittersweet. "Although I am sad we lost so much time with him," she lamented November 16th on Go Fund Me. "I am grateful for the time we have left. We will cherish every single moment." Thanksgiving, which is only a few days away, is bound to be not only special but totally unforgettable this year at the Thompson house in Longmont and with that in mind it is appropriate to express two wishes. The first of which is that for Pilot to have a speedy and successful recovery that is followed by many more happy and joyous years. Secondly given that mulligans usually are only doled out on the golf course, it can only be hoped that Thompson and her family fully appreciate what a tremendous gift that they have been given and that they will endeavor to make good on their pledges to Pilot by loving, cherishing, and honoring him for every minute of every day that he has left upon this earth. Carpe diem! 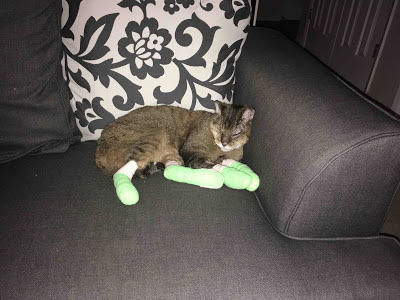 Photos: PetCare (Pilot with singed whiskers, the vets, and in an Elizabethan collar) and Go Fund Me (Pilot's bandaged paws, with Thompson, with her daughter, and asleep at home). "I saw the compassion in her eyes (his daughter's), and I knew I had to save (the) cat." The cat world has been plunged into mourning once again by the premature death of yet still another of its most cherished and long-suffering citizens. 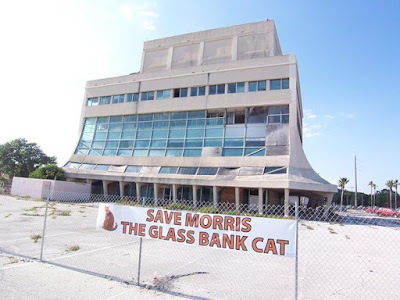 "It is with a very sad heart that I have to post that Morris the Glass Bank Cat was found deceased yesterday morning," it was somberly announced September 20th on the Facebook page, Save Morris the Glass Bank Cat. "There was no sign that he was feeling sick, so this was completely unexpected." Since late May of 2014 he had resided at Purrs and Whiskers Shelter at 4251 Turtle Mund Road in Melbourne but since that organization has not released any additional information it is not known even if a necropsy was performed on him. It additionally has not been revealed what was done with his remains. The best therefore that can be hoped for is that he was afforded a proper and dignified burial on the grounds complete with an appropriate grave marker and flowers. It would be painful to later learn that his corpse had been either burned to cinders or casually tossed out in the trash. The orange Manx, who not only resembles but was named in honor of 9Lives®' emblematic figurehead, was catapulted into public consciousness during the third week of April in 2014 when he was accidentally spotted in an upper floor window of the condemned Glass Bank on North Orlando Avenue in Cocoa Beach, thirty-three kilometers north of Melbourne. Fortunately for him, the individual who first noticed his desperate plight was civic-minded and kindhearted attorney Tony Hernandez. "We are always vigilant when we walk by it," he told Florida Today of Melbourne on April 30, 2014. (See "Lawyer Steps Up to Save Elusive Glass Bank Cat.") "We always look at it." Constructed in 1960, the building originally was home to a branch of the ubiquitous First Federal Bank of Florida but it and the other tenants pulled up stakes and vacated the premises either before or shortly after Hurricane Frances pummelled the structure in 2004. Owner Frank Wolfe continued to live in the penthouse until January of 2014 when he too left, albeit by the Roman way. Even the structure's moniker had become obsolete by then in that much of its glass exterior had been covered over with concrete by as early as 1981. So, by the time that Hernandez had tumbled to Morris' presence he was the last known surviving soul still in the building and by then even it had an impending date with the wrecking ball. Given that shysters are such notoriously tight-fisted penny-pinchers, it is far from clear what exactly motivated Hernandez to take on Morris as a pro bono client. 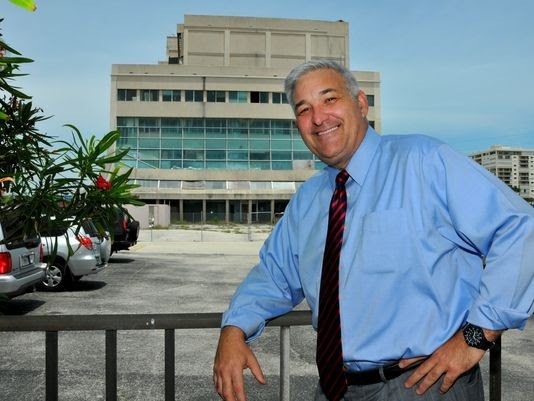 "I really want that building demolished," he averred to Florida Today. "I don't want this to turn into me being an animal activist and chaining myself to the fence, because that is not going to happen." Later on in the same article, however, he was singing an altogether different tune. "That building already has a lot of bad, negative aura," he added. "Let the world know we are people with compassion, even when it comes to a little cat." Apparently it took even considerably more than his daughter's compassion to have gotten him off the schneid and that in turn led to his fourth explanation. "My daughter would not leave me alone about this," he confessed to WFTV of Orlando on May 23, 2014. 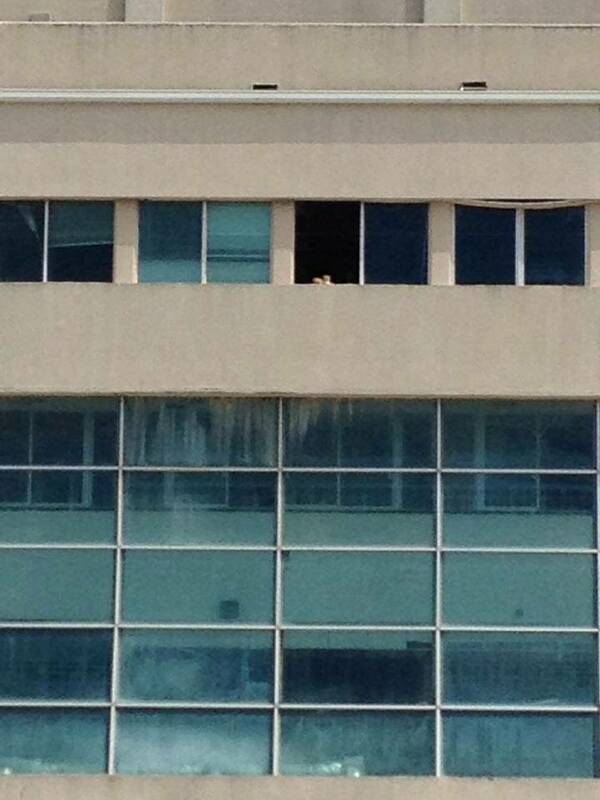 (See "Morris the Cat Rescued from Glass Bank Building.") 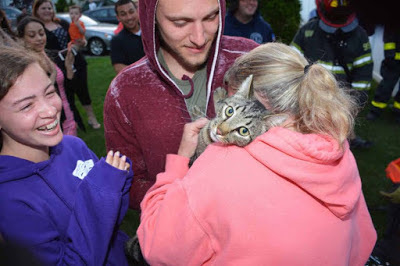 "She wanted me to assure her that the cat was going to be saved." Regardless of his true motivation, he did not waste any time in starting a spirited political campaign to save Morris that included the stringing a large banner in front of the bank and pledging to donate US$1,000 of his own money to any rescue group that would humanely trap and remove him from harm's way. He also established the above mentioned Facebook page which soon attracted such notables as the lovely Barbara Eden from the 1960's comedy television show, I Dream of Jeannie, and followers from as far away as Brazil. It took some doing but Morris was finally corralled on May 18th by, it is believed, representatives of Purrs and Whiskers. "It was an ongoing, clandestine effort on the part of real experts on cats," was the sum total of all that Hernandez was willing to divulge to Florida Today in the May 19th article cited supra. "After several days of planning and executing, I must say the rescue effort went perfectly." Morris immediately thereafter was transported to Clearlake Animal Hospital in Cocoa, twenty-four kilometers east of Cocoa Beach on the mainland, where he was sterilized, vaccinated, and put underneath the microscope. "Right now, the cat is at an undisclosed location where he is going through a three-day evaluation process," Hernandez added. "If experts say it's feral, we'll look for a registered colony for him. If it's adoptable, there's a long list of people. But they'll have to have the right house." Apparently having tired of the entire affair, he quickly formulated plans to wash his hands of it. "We've had everybody asking us, television stations, CNN," he groused to Florida Today on May 19th. "I just want to have one good media blitz and put this whole story to rest." That occurred a few days later on May 23rd when Morris, still caged but mercifully not bound and gagged, was introduced to the world and the media. Mayor Dave Netterstrom certainly did his part by declaring that occasion to be officially known now and forever as "Morris the Glass Bank Cat Day." Even though Netterstrom and Hernandez may have been crowing like a pair of bantam roosters, Morris was conspicuously silent throughout the entire event. "Morris is not all too happy," Hernandez confided to Florida Today. "We've evicted him from his beautiful skyriser(sic) across from the beach and (neutered) him, but it's in his own best interest." That last admission on his part was in direct contradiction to what he had said a few weeks earlier after Morris had been successfully trapped. "My client would like to thank everyone for their support," he told Florida Today on May 19th. Be that as it may, he did not either flinch the least little bit or squeal like a stuck pig when it came to finally making good on his prior commitment to Morris. "I want everybody to remember what the best nation in the world is, and that is the Do Nation," he declared on that memorable occasion according to the account of the proceedings rendered in Florida Today on May 23rd. "Most of these animal rescue organizations survive financially on their own money, or money being donated by other people, so on behalf of Morris and my law firm, I would like to take this opportunity to donate to Purrs and Whiskers Shelter $1,000." That prompted onlooker Mike McGahey of Canna Proposals in Cocoa Beach to chip in with another US$100 on the spot. That in turn left it up to Mona Motz of Purrs and Whiskers to reveal to those assembled what lot in life she and her colleagues had assigned to Morris. "He is not extremely friendly like you would expect a lap cat to be," she told Florida Today in a prelude to lowering the boom on him. 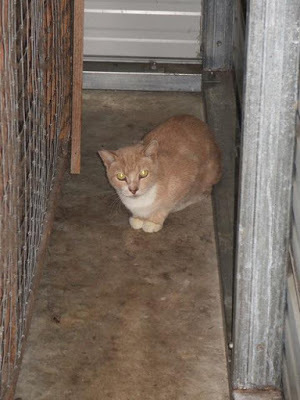 "He will be placed in either one of two feral cat colonies that are safe and cared for daily." That decision was all the more inexcusable given the subsequent amount of time and energy that the shelter invested in him before turning him loose at its fenced-in TNR colony. "We had to transition him. He didn't just get plunked in with this feral colony," Motz added to Florida Today on September 26, 2017. 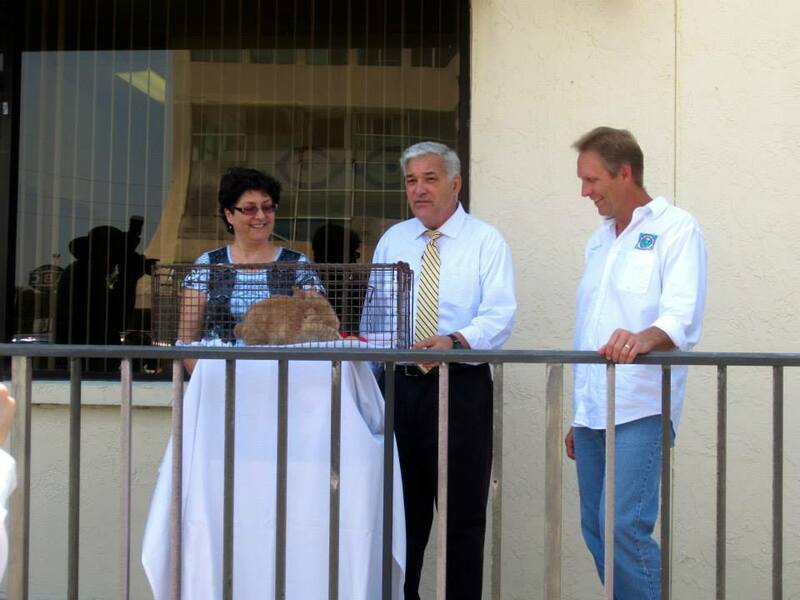 (See "Morris, the Glass Bank Cat of Cocoa Beach, Dies.") "We put him in what we call a relocation cage, which is like a big condo, and let him get used to the routine, the area, the sounds, the smells, the other cats." 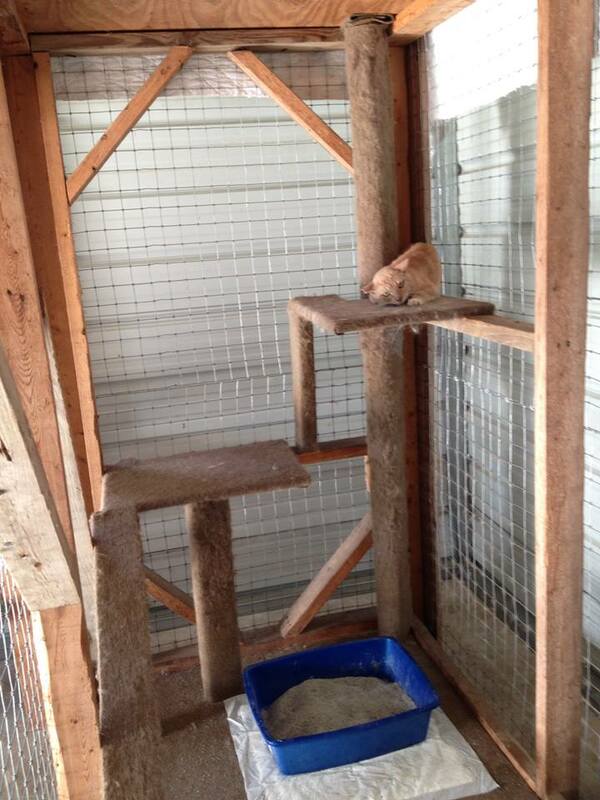 In addition to large cages with elevated resting places, the shelter features one-thousand square feet of outdoor space for its resident felines to explore. It never has been revealed, however, how much of the time that Morris was confined to his cage or the amount of interaction that he was afforded with his human counterparts. At least he did not suffer from a lack of feline companionship. 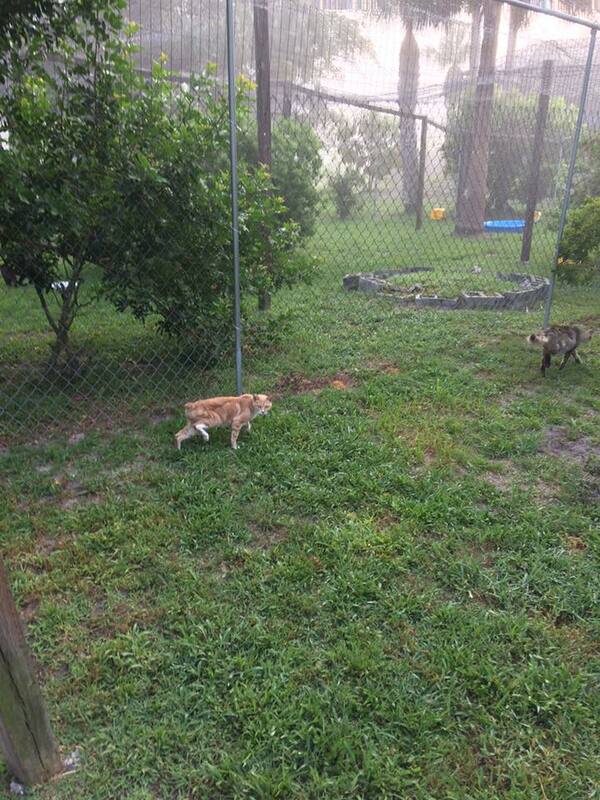 "Morris had his buddies that he would hang out with," Motz revealed to Florida Today on September 26th. That notwithstanding, a good argument could be made that he would have been far better off if Purrs and Whiskers had devoted its time, money, and energy toward socializing him for adoption as opposed to a lifetime behind bars at a fenced-in TNR colony. Furthermore, since it has not been disclosed how many cats live at the shelter and under what conditions it is not even possible to begin to properly evaluate the quality of life that Morris enjoyed there for the last three and one-third years of his life. Although sanctuaries are most definitely a huge improvement over conventional, hellhole shelters, not all of them are created equal. For example, Tenth Life Sanctuary in Clewiston, two-hundred-fifty-eight kilometers south of Cocoa Beach, was closed in 2010 owing to unhygienic conditions and neglect of its inmates. It therefore is imperative that such undertakings remain exclusively in the hands of the volunteers. Besides, the politicians are too cheap and ailurophobic to contribute so much a red cent to such efforts; au contraire, they simply want to gain control of these colonies so that they can impose their malevolent wills on both the cats and their caretakers. It is important to point out at this juncture that no evidence whatsoever has come to light that would tend to indicate that Morris was in any way either neglected or abused while he lived at Purrs and Whiskers. There likewise is not any guarantee that even if had he been put up for adoption that he would have been placed with a conscientious guardian who took his care and welfare seriously. 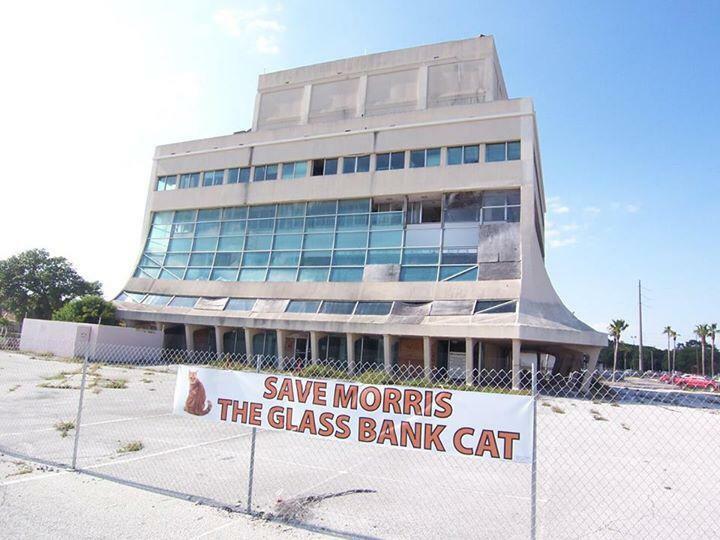 In April of last year, Morris decided to enter the political thicket and a second Facebook page entitled "Morris 'the Glass Bank Cat' for Cocoa Beach City Commissioner" was established in order to promote his candidacy. His campaign never really got off the ground, however, and his Facebook page attracted only one-hundred-nine followers. Other than that tidbit of information gleaned from the web, almost nothing is known concerning how that he spent his years at Purrs and Whiskers. Then on December 15th the shelter's operator, Karen Clarise Gibson, established a page on Go Fund Me entitled "Morris the Glass Bank Cat Vet Visit" which quickly raised every cent of its US$450 intended goal. As it later was revealed, Morris by then, sadly, was suffering from liver failure. That acknowledgement accordingly makes the shelter's September 20th declaration on Facebook that his death "was completely unexpected" more than a little puzzling. 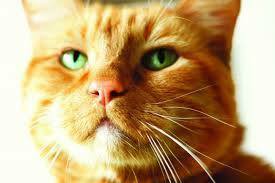 Since Purrs and Whiskers has not elaborated on his condition it is impossible to know exactly what ailed his liver. Generally speaking, however, liver failure in cats can be caused by tumors, toxoplasmosis, a build up of fat, the ingestion of toxins, and the development of portosystemic shunts whereby the blood bypasses the liver and is returned to the circulatory system without first having been cleansed. Needless to say, US$450 would not have covered very much of that. In fact, such a piddling sum would have barely gotten Morris inside the front door for even so much as a cursory examination by the bloodsuckers at Clearlake Animal Hospital who state emphatically on their web site that they must have all of their shekels in advance. The funds donated by Hernandez and McGahey in all likelihood would have been sufficient for a diagnosis, detoxification (induced vomiting, enemas, stomach pumps, and activated charcoal), and an improved diet for Morris. Additional funds would have been required for, inter alia, follow-up veterinary visits and, if needed, surgical intervention. 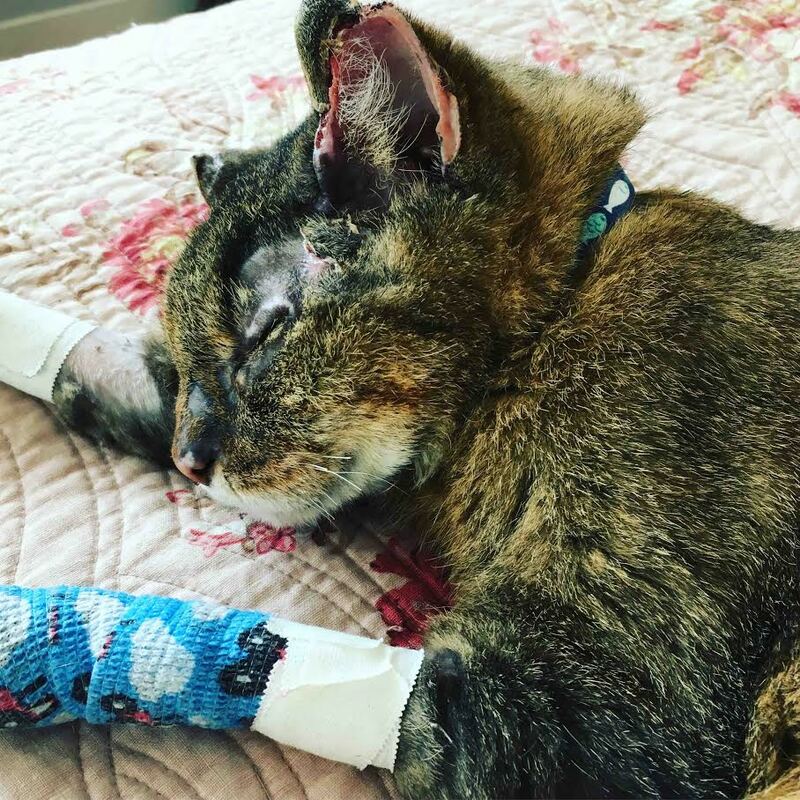 It therefore is unclear whether it was a lack of money per se, veterinary incompetence, or Purrs and Whiskers' unwillingness to have his liver condition properly attended to that ultimately led to his premature death. At the same time it is every bit as likely that his hardscrabble past simply caught up with him in the end. Not only is life on the street difficult, dangerous, unhygienic, and disease-ridden, but it is strongly suspected that congenital maladies are the number one factor in the shortened life-expectancies of homeless cats. That phenomenon is even more pronounced in kittens. That tragic pattern certainly held true in Morris' case in that he was believed to have been somewhere between one and two years of age at the time of his discovery and rescue. That in turn would have made him either four or five years old at the time of his death and although it is said that the good die young that was much too soon for any cat to exit this world. No one has hazarded so much as a guess as to where he came from but the most likely explanation is that he, or his mother before him, was abandoned to fend for himself by either a resident of Cocoa Beach or a tourist. While it is always conceivable that he could have been driven in from the mainland with the intent of purposefully dumping him that seems considerably less probable. Given that Manx kittens retail for between US$200 and US$400 apiece, it is strange that his previous owner would have simply dumped him as opposed to having sold him. That coupled with his fear of humans, lends a certain amount of credence to the theory that it was his mother who was abandoned and that he subsequently was born sans-abri. As for how that he lived, Wolfe could have been feeding him. 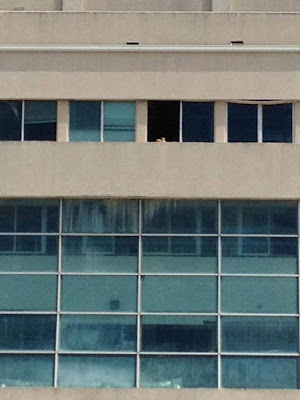 Although it is not known if he was a cat fancier, the fact that Morris' presence in the Glass Bank was not detected until shortly after his suicide may not have been a coincidence. No details have been divulged concerning security arrangements at the condemned building but unless Morris was carried to the upper floors by someone, he would have required not only ingress to the building via either a door or a window but, more crucially, open and unlocked doors that led to the first, second, third, and fourth floors. There simply is not any conceivable way that he could have operated the elevators even if they still had been working. Hernandez and Motz may know the answer to that riddle but based upon the limited information available it would appear that he was brought inside by either Wolfe or someone else with keys to the facility. After Wolfe's death it is quite possible that he survived on mice, bugs, and condensation. If doors to both the stairwell and the outside had been left open, he could have been scavenging in the street and returning to the bank to sleep. It also is conceivable that someone living nearby could have been feeding him but was unwilling to come forward and claim him once he had become famous. "He was healthy," was about all that Hernandez was willing to disclose to WFTV concerning his condition after his rescue. "He was emotionally scared, a little shocked." 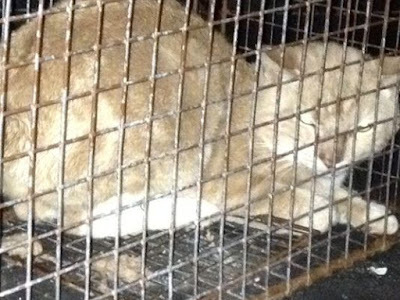 That in itself is not conclusive in that it is not known either how long it took Purrs and Whiskers to trap him or how successful that he might have been in pilfering food from their snares before he himself was caught. Nevertheless, if Hernandez is to be believed Morris was neither emaciated nor dehydrated. That does not automatically foreclose the prospect, however, that he may have been forced in the past to have gone without both food and water for prolonged periods of time and that in turn could have irreparably damaged his liver and kidneys as well. For example, a beautiful nine-year-old Persian named Tavia from Kissimmee, one-hundred-seven kilometers due east of Cocoa Beach, was intentionally left in an empty, unheated house by her owner for more than two months back in 2010. She additionally was provided with very little to eat and drink and that ultimately led to her premature death from liver and kidney failure. The condition of his fur, nails,and feet would have provided additional clues as to how that he had been living. So, too, would have the presence of parasites in his fur and their toxins in his blood. It was a good thing that Hernandez had his eyes in the clouds as opposed to using them in order to pan the pavement for pennies on that fateful day back in April of 2014 because otherwise it is highly unlikely that Morris ever would have made it out of the bank alive. If that had not been the case the world never would have known that he ever existed. In that respect, his deliverance bears a striking resemblance to that of a brown and black tom with yellow eyes named Mario from Lac-Mégantic, two-hundred-fifty-four kilometers east of Montréal in Eastern Townships, Province Québec, who was forced to spend seventy-nine days all alone and without food and water in a deserted building after an American-owned oil train carrying Bakken crude exploded. His salvation finally came on September 21, 2013 when Mario Vachon, who was conducting a survey of deserted buildings in a sealed-off section of town, accidentally spotted, not him, but rather his silhouette in a window. Looking back over the course of Morris' brief and troubled life there is not any way of getting around the conclusion that his lot from start to finish was one of abandonment, neglect, deprivation, and incarceration that ended in sickness and an early grave. Moreover, there are not any true heroes in this story. Although Hernandez is to be commended for mounting and financing the rescue that saved Morris, he contributed absolutely nothing toward ensuring that he was placed in a proper home and received the top-notch veterinary care that he so urgently needed and richly deserved. The same charges are even more applicable in the case of Purrs and Whiskers. Netterstrom, the capitalist media, and the citizens of Cocoa Beach likewise patted themselves on the back for rescuing Morris, took their bows, and then got on with their lives. On the whole, it is difficult to escape the feeling that the entire "Save Morris" effort was little more than a cheap publicity stunt staged by one and all involved to make themselves look good in the public's eye but with precious little regard for either Morris' well-being or desires. He most assuredly deserved far better treatment than he received! What the feline protection movement so desperately needs are individuals and organizations that are sincere and put the needs and desires of cats first. Believe it or not, that is an entirely different enterprise than public grandstanding, running off at the mouth, buffoonery and, above all, sucking up to the elites. It would be comforting to believe that a far better winter awaits but that would be a pipe dream. With cats, neither the dying nor the killing ever abate for very long. Finally, the Glass Bank disappeared from Cocoa Beach's skyline on Groundhog Day of 2015 and now Morris has joined it in that eternal pit of nothingness. All that remain are the memories, photographs, and a passel of regrets and what-might-have-beens. Photos: Facebook (Morris up-close, in a window at the Glass Bank, Save Morris banner, Morris, Motz, Hernandez, and Netterstrom at ceremony, Morris in a cage and on the grounds of the sanctuary, and the final goodbye) and Florida Today (Hernandez, Morris in a cage immediately after his capture, and Morris in a cage at the ceremony).